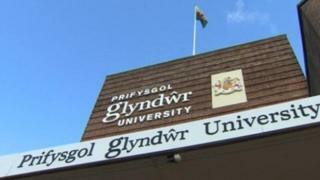 A task force has been set up at Wrexham's Glyndwr University aimed at lifting its suspension from recruiting overseas students. It follows a Home Office inquiry into alleged visa fraud which found some may have obtained fraudulent English language certificates. The university said senior staff were looking to "explore and implement solutions" to issues raised. Two unions have passed no confidence motions in university heads. An inquiry found nearly 50,000 immigrants across the UK may have obtained English language certificates required for a student visas, despite not being able to speak it. A university spokesperson said the task force was working to overcome challenges raised by UK Visas and Immigration (UKVI) and was "cooperating and engaging fully". "We are committed to addressing any concerns raised by the Home Office and eliminating any abuse of the student visa route," he said. Meanwhile, Unison members have joined the University College Union (UCU) in passing a vote of no confidence in vice chancellor Prof Michael Scott and the chair of the board of governors, Sir Jon Shortridge. Geoff Edkins, Unison's regional organiser, wants the Welsh government and Higher Education Funding Council for Wales (HEFCW) to step in. "The university was already grappling with financial difficulties following poor managerial decisions," he said. "Staff and students are already facing an uncertain future with the threat of compulsory redundancies and the suspension by UKVI of Glyndwr's licence will leave a massive hole in Glyndwr's finances." Education Minister Huw Lewis has already asked HEFCW to look into the matter, saying it had "potentially serious implications not just for the institution but for the reputation of the higher education sector as a whole".